Uber might say that hanging out on the curb is for fire hydrants, but in parts of the world that still prioritize public transportation, creative bus stops make street-side waiting fun. You can sit inside a giant strawberry or watermelon in Japan, swing on pop-up playgrounds in London, or even pick up a book from a bookmobile in Colombia. Not so much in the U.S. We all know our national priorities: Cars are first; light rail is a fancy second; and although the excellent (and cheap!) bus rapid transit design is poised to have its day in the mid-road sunshine, buses are too often a slow number three. Which means that, while Caribou Coffee will transform the odd waiting space into a giant oven to push its breakfast sandwiches, most bus stops have a sparse utilitarian design featuring only benches, schedules and the occasional vodka ad. But this isn’t always the case. Inspired by a creative new bus stop in Baltimore that literally spells out its function, here are a few stateside terminals that are also public art installations, making you want to join the fire hydrants and hang out on the curb. Designed by Spanish Art Collective Mmmm…, this towering wooden structure spells outBUS in 14-foot-tall font. 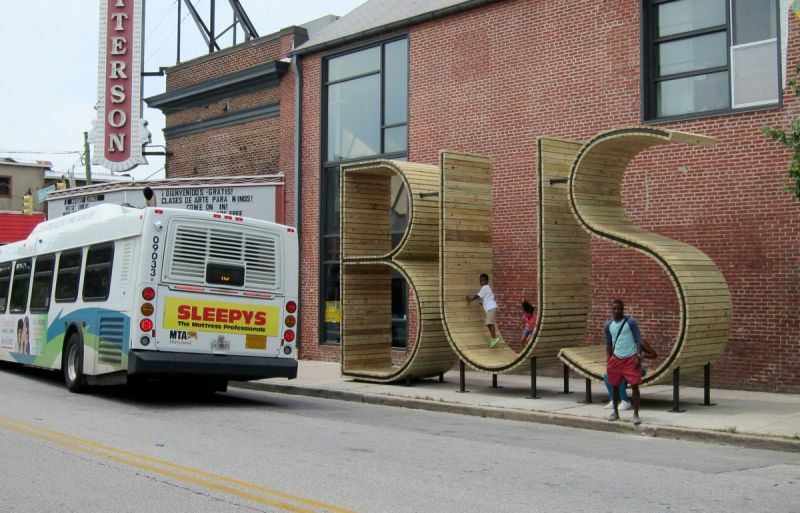 Dubbed the Obvious Bus Stop by its creators in an interview with Slate, the stop is part of an initiative called TRANSIT: Creative Placemaking with Europe in Baltimore. The collective’s mission was to “transform the dull experience of waiting for the bus to an entertaining, leisurely space in the middle of the hectic rhythm of the city.” With the B a perfect rain shelter and the U and S ideal for adults to lounge and kids to climb and slide, it appears they met their goal. Along with creative bike racks and murals, the City of Ventura now includes Bus Home in a placemaking effort called “Public Art That Really Moves You.” But between resident opposition, decay, a costly lawsuit and the oft-repeated complaint that its design provides little actual shelter from the elements, this particular hallucination may have faded over time. 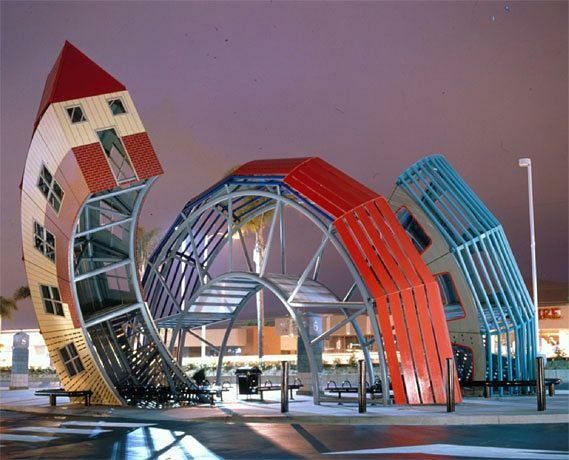 Still, Oppenheim apparently liked the sculpture so much he replicated its central imagery — a loop leading to a house — for a public transportation hub in Grand Rapids, Michigan. 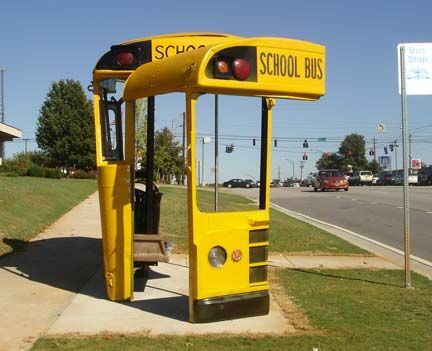 Funded by the Athens Area Arts Council and specially designated public funds, this series, built in several installments, includes a shelter made of welded-together school buses, a tribute to R.E.M.‘s “Beat a Drum” and a memorization of the B-52s “Love Shack.” The school bus sculpture, created by artist Christopher Fennell, includes Athens buses from 1962, 1972 and 1977 with an old city bus seat from Atlanta. 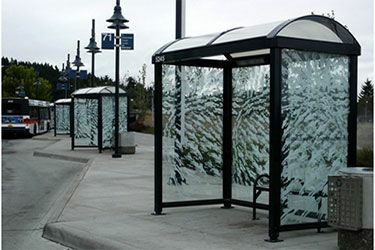 In 2001, Portland-area planners took lemons (in this case, bus stop windows damaged by graffiti) and made beautiful lemonade, hiring artists to sandblast them with intricate patterns. 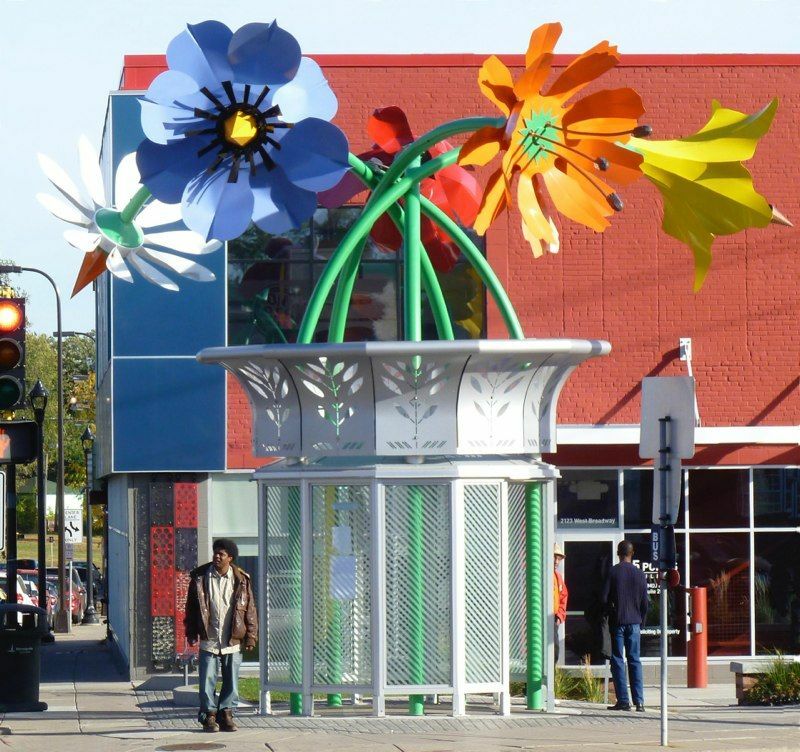 The tactic worked so well that all new bus shelters get these “art panels” now, according to TriMet’s website. Six artists have created different patterns — two location-specific, four widely circulating — that incorporate symbols from the local landscape. This multi-story flower vase was designed by Minneapolis-based landscape architectMarjorie Pitz. Seeking to create a “unified sculptural landscape,” the project joined up city and Metro Transit resources for the busy plaza at Penn and Broadway in Minneapolis’s northern section. Apparently the massive flowers are resilient; in 2011, theysurvived a tornado. 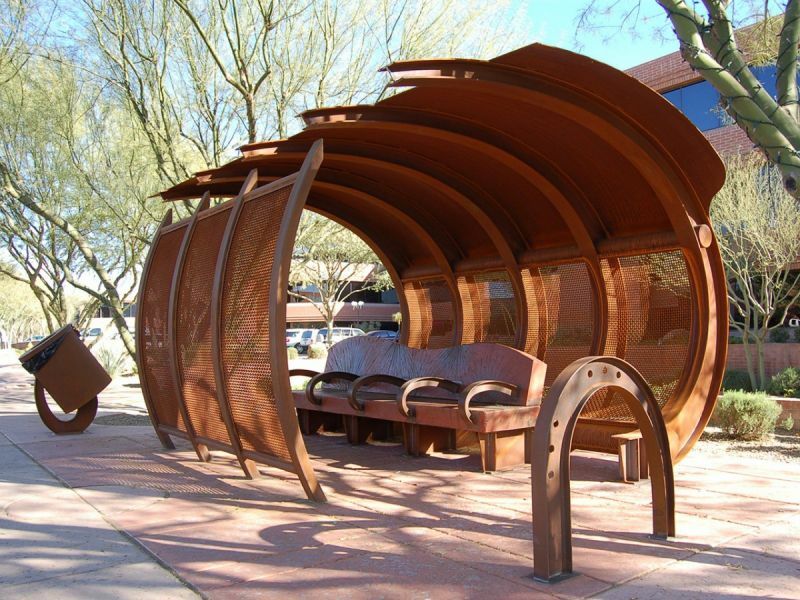 Completed by Kevin Berry in 2006 for Scottsdale Public Art., these creative, claw-like wave shelters are both interesting to look at and functional; their heavy tops provide shade and their mesh sides let air flow through for hot Arizona days.